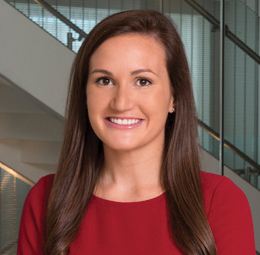 Katherine Dampf practices in the area of business law, particularly in the areas of commercial real estate, contracts, finance, corporate governance, mergers and acquisitions and agricultural cooperative law. Ms. Dampf’s practice includes drafting and negotiating contracts, purchase agreements, leases and servitude agreements; representing franchisees; representing buyers and sellers in the acquisition and sale of commercial real estate, small and large businesses, hotels and multifamily apartment complexes; representing agricultural and marketing cooperatives; entity and joint venture formation; and general counseling of both emerging and established businesses. During law school, Ms. Dampf served as a judicial extern for the Hon. James L. Dennis of the U.S. Court of Appeals for the Fifth Circuit. Representing clients in the acquisition, development and financing of hotels and multifamily apartment complexes. Representing developers in the acquisition, development and financing of large tracts of land for retail, commercial, agricultural, industrial, residential and mixed-use developments. Presenter, "Recent Developments in Land Use and Zoning Law (2016)"